Phoenix Deer Valley Airport is located 15 miles North of downtown Phoenix. From PHX take I-10 West to I-17 North to Loop 101 East. Exit at 7th Ave, drive north to the airport entrance on Deer Valley Dr. (7th Ave.). Or take I-10 West to AZ 51 North, to Loop 101 West, to 7th Ave, drive north to the airport entrance. 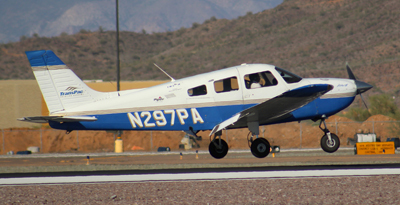 Deer Valley Airport is home to many light aircraft, business aircraft and several aviation related businesses. Thunderbird Aviation has a varied collection of interesting aircraft used for filming and various events. Click on the T-Bird Aviation image below for the Cutter Aviation web site, an FBO located at DVT and PHX. 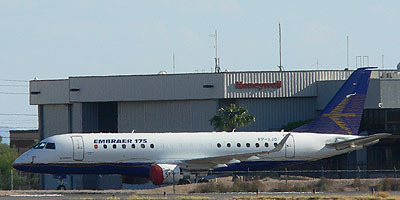 Honeywell Aerospace also has hangars at DVT and some of the newest Embraer jets have been seen at their facility. TransPac Aviation Academy (formerly PanAm Flight Academy operates flight training out of DVT. Small charters and sightseeing flights are also available out of DVT. Deer Valley Airport has hosted several air show events over the years. Local flights around the Valley of the Sun have taken place to raise money for charity, as well as other events. The North Valley is popular with Hot Air Balloonists, and many Balloon companies operate in the area.